[The] statement "morality is a conceptual human construct rather than an actual thing that exists independently of our brains" is itself an article of faith, i.e. an assumption behind an assumption. The comment he is quoting is my own, and his conclusion was that I am taking a position of faith. No, dammit. I am taking a position of parsimony. The conversation I had regarding consciousness was quite similar; I was accused of being dogmatically materialist by suggesting that spiritual explanations of consciousness have been both futile and superfluous. Let's take a look at the basic position of parsimony here. 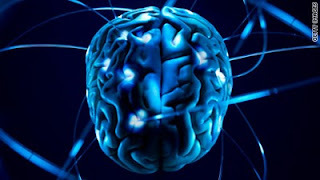 The aforementioned morality discussion arose in reference to a study, posted here on CNN, in which researchers used a technology called transcranial magnetic stimulation to interrupt activity in specific regions of the brain, which allow the researchers to manipulate subjects' moral judgments. Fascinating stuff. Obviously, morality in this case was wholly dependent on the brain. Sort of like when someone is brain dead, they are not conscious; thus, consciousness appears dependent on the brain. Now, does this mean that morality itself does not or cannot exist separately from the human brain, and may come from some ethereal spiritual realm, the Matrix, God, mind-controlling alien overlords, or the Flying Spaghetti Monster? All of these scenarios, regardless of how absurdly improbable they may be, are possible. But why should we care about any of them? None of these scenarios add to our ability to explain these moral functions in any way. All such explanations are completely superfluous. How can we know this spiritual realm exists? What is its nature, its laws, etc., and how can we know? How does it interact with our brains and influence our knowledge and behavior? How can this interaction be independently examined and verified? How could we make falsifiable predictions based on this knowledge? Do these predictions, if verified, explain moral decision-making better than material explanations? The problem is that theists think that if you don't entertain the possibility that some kind of spiritual woo woo exists, you're being dogmatic. No you're not; you're being parsimonious. There are literally an infinite number of possible explanations for the origin of things like morality and consciousness. We certainly don't go around saying we're open to the "Matrix Theory" of consciousness, partly because it's based on a silly movie, but mostly because we recognize that since there's no evidence that it's true, invoking it as an explanatory mechanism is a waste of time. We're not required to be intellectually agnostic about the Matrix Theory of consciousness until someone actually posits independently verifiable evidence that it is true. Now, if someone says that morality or consciousness transcends the physical brain and can then construct a means by which to independently verify such claims and construct falsifiable hypotheses from them that can demonstrably explain observable phenomena better than material explanations, we can start having an informed, open discussion on the matter. But until that actually happens, we skeptics are not obligated to be open-minded about it. Mike, as one of your counterparts in referenced discussion, I'll add. First, I've never been to a church service of any kind in my life, weddings excepted. Generally, your logic seems strong and you're well prepared to debate. I don't think there's anything wrong with your skepticism, but I don't understand why you're actively attempting to debunk the concept of spirituality. In my own life spiritual ideas have been very stabilizing and coherent in the face of some significant life challenges. Instead of being unbalancing or leading to fanaticism, it's provided a background meaning to my life. I associate it with a warm and fulfilled feeling. I very rarely discuss my person beliefs with others, because it's personal. Everyone should make up their own mind. I certainly don't think of less of someone for their personal philosophies, whatever they may be. I do, however, think less of those who impose their beliefs upon others. That's why it's unsettling to read your work sometimes. I realize that it's frustrating to feel like people aren't adopting the same standards of logic that you are. Allow me to try to explain the context I'm operating in. I can speak for myself and say that I give credence to broad patterns of subjective experience in my life that lead me to feel confident that there is a richness to reality that is greater than myself, and which may be described as spiritual. I don't know if it's actual, but it's a personal reality to me. I accept the possibility that it may be an artifact of my brain. Because it fits the elements of life together so well for me, I choose, however, to utilize my personal philosophy in my strategy of living. My philosophy doesn't conflict with observed facts, although it is not captured by empirical observation. I feel no need for others to join me. I really don't. In case you're interested, my philosophy can be distilled down to the idea that our purpose is, through experience, trials and tribulations, to grow. This happens as we work through interpersonal, moral challenges. Note: not by living by a crystalized moral code, however. Growth is fluid and achieved by struggling and making choices, not by blindly following rules. Finally, I have faith that there is some purpose for all this. I hope that this helps you to understand my position, and perhaps allays frustration. I understand the logic of occam's razor as it applies to materialism as you've argued it. However, given that spiritual reality seems such a reality in my personal experience, its existence, then, becomes the most coherent and replete description. Materialism seems myopic, to fall short, and unconvincing. Mike, I really do appreciate the opportunity to discuss with you. Like our man B. Obama says, we should disagree disagreeably. Mike, first of all, I see your distinction and appreciate it. Another way of putting it is, I think, that it is not an act of faith to refuse to have faith in a negative that can't be proven. That said, I have two points that may seem critical. First, these people may be responding more to your fervor than to your reasoning. Most people become fervent about their families. If a religious person becomes fervent about anything else, he likely becomes fervent about his religion, his faith. Thus, when he is engaged in an argument with someone about religion and that person is being fervent, as I'm sure you were, he may start to feel like he's arguing with someone who is a faithful of another religion; like a Christian arguing with a Hindu. Thus, he might easily glom onto some irrational argument that you also are acting on faith, because the way you act looks to him like the behavior of a person of faith. Second, you have to remember that there is one big pile of evidence for any established religion, a kind of evidence which does not exist for things like the Matrix-theory of reality or Dawkins' flying spaghetti monster. This evidence can be very convincing to people. It is the fact that millions of other people also believe. Sure, we know that many people of the same religion disagree on fundamental aspects of that religion and we know that most people have their own unique theological ideas if you dig down into them. Still, a Christian looks around and sees millions of other Christians. She knows that her ancestors going back a thousand years were Christians. Her wise, old grandmother and grandfather are devout Christians. This is a lot of evidence to a human and it requires a pretty big jump of rationale to get over it; namely that all of those people are and were wrong. This also relates to the evidence people might see for a moral construct external to human brains. Morality has a strong social component, of course. People are taught the concepts of the particular morality of their communities by their communities. Thus, morality does seem to 'exist' outside of an individual's brain, but only because it exists across multiple brains in a way that is most likely completely approachable by science. None the less, a religious person (and non-religious people as well) can look around and see that almost all of us agree that murder is wrong, thus the fact that murder is wrong can start to look like it is written into the fabric of the Universe somehow. I make these points not to disagree with your arguments, I agree with your arguments. I make them because thinking about them when you're having a discussion with such a person might give you some insight into how to break through to that person. Right or wrong (neither of which do I believe in as an external construct), the person with sight must be understanding of the particular sensitivities engendered by blindness when helping a particular blind person to see. These are absolutely fantastic comments, and it makes me very happy to know that such intelligent, thoughtful people are reading my blog. Sorry it's taken so long for me to reply. So first, thank you. I can't reply to everything in the above comments (I'd be here all day), but I want to offer a couple of thoughts. N, I think you and I have articulated our divergent views pretty clearly in our dialogue on FB, but I'll just reiterate a single point: that I only believe that one's outlook should follow from evidence. We gain nothing from making up inferences about supernatural or spiritual things in an attempt to make sense of the world or our experiences, essentially because – if our knowledge does not follow from evidence – we're just making it up. Such outlooks cannot be considered "knowledge" at all. I'm willing to entertain the possibility of spiritual things, but I think appeals to such things tend to raise more questions than they answer. Alt 255, that's a very clear point about the appeal to majority. It's definitely true that a reluctance to reject or even question religion and supernatural beliefs stems in part from the fact that so many people hold such beliefs. To all your other points, I agree completely. It's difficult to, as you say, make a blind person see. My intent is not so much to change their minds, but to convince them to consider things they might not previously have considered in the hope that they will begin to think for themselves. Thanks again both of you for such lucid insights.